Well… it was off to see them then! They should be about ready to start the practical “test” in their new city! The testing chamber itself was located in the Bureau of Humanity, and was lavishly appointed and decorated with images of major cities throughout Creation’s history, done in typical Yu Shan style. Gri Fel and Terapishim were in the back, relaxing before the test began. Huh! He couldn’t build them a manse in there! And he’d been hoping that that would really help… Maybe if he was allowed to join in remotely or as an ally? The arena could account for things that the participants knew would be available to help! Gri Fel and Terapishim were quite happy to see him; they’d been really hoping that he’d be available to help out. And allies – especially god-bloods and mortals – were allowed! That was a part of why Gri Fel and Terapishim had summoned him! The judges informed Charles that that was, indeed, the procedure. Huh… He reviewed the Crystal Arena’s design for the moment… The systems wouldn’t necessarily show the observers outside too much of the details of what went on, and observers in the simulation would be limited to whatever charms they could use normally… The scale for outside observation would be fairly small effectively… They judges were mostly interested in the final results, although they were monitoring for demonic, deathly, or fey Essence. Hm… He should be able to get away with accelerating things as long as he channeled it through an artifact. The proctor was ready to begin – so Charles attuned to the Arena. That took him, along with his six Coatl, Gri Fel, Terapishim, and the Proctor, into a hyper-realistic simulation of Arcosanti and it’s environs – to be informed that the test would involve seeing how they handled several scenarios common to cities in contemporary Creation, including natural disasters, crime waves, and social controversies. At least one of thes scenarios would be of an occult nature, since that was what gods were often most vital in dealing with these days. Scenario effects and solutions would be cumulative, and there would be a preparatory period of one virtual month to get settled in, explore the city, and get acquainted with its people and resources. They did, after all, want to see what the city gods would put up in anticipation of such scenarios. Preparedness counted too! Not too surprisingly, the Proctor – and the view the audience was watching – was primarily focused on the two Gods; a god-blooded artificer – however skilled – just wasn’t as noteworthy as seeing one of the great city gods of a prior age trying out for a new position. That didn’t mean that a few people in the audience might not be primarily interested in Charles – but they’d have to settle from what they could get whenever he was on-screen, or was in the Proctor’s report later on. Gri Fel promptly started touring the city – using his Rod of Construction to reinforce walls and foundations, to upgrade doors, to improve facilities and security, and to otherwise make small improvements in passing – just to start. Terapishim embarked on a tour of the environs, using his Verdigris Staff to ensure that the local region was as fertile as a desert environment should be (and then a bit), enriching the earth, purifying contaminated areas, and using some sort of blessing Charm to ensure that the topsoil would resist any erosion. While most eyes in the audience, the proctor’s eyes, and the illusion-focus, was on Gri Fel and Terapishim, Charles trotted right down into the middle of the nascent demesne, pulled out a weird vaguely egg-shaped mass of magical materials – a “manse seed” – and planted it there, covertly channeling his own power through it to cause it to grow into a Bazaar of the Bizarre Manse and activate the demesne. OK, it was only a modest cube of sculpted stone on the outside – another vaguely-decorative element in Arcosanti’s landscape – but all three gods jerked with surprise as a wave of geomantic energies poured over the city. Gri Fel and Terapishim recovered quickly – they’d almost been expecting something like this, given their young friend’s artificing abilities and his inquiries into the cities growing demesne – but it was impressive nonetheless! The Proctor was… rather shocked. Yes, they’d included the nascent domain forming in the city in the scenario – but hadn’t seriously considered the possibility of anyone taking advantage of it in the short space of a one-year afternoon simulation! Unless he’d gone crazy, that was the power-signature of a Rank Four or even Five Manse! The demesne had only been Rank Three to start with! Within two HOURS? Meanwhile, the young god-blood that Gri Fel and Terapishim had towed around was busy weaving… citywide wards against fires, toxins, pollution, flooding, pestilence, storms, wind, lightning, hail, falling buildings and lesser objects, breaking glass, falling injuries, volcanoes, meteors and glaciation (oh come on! had the child been watching disaster movies???). Commendable skill and thaumaturgical power there, but it didn’t explain the Manse or the power flooding through it! A “Programmable Manse Seed”? What in the wyld was a… Wait; wasn’t this child rumored to have uncovered a horde of artifacts? No wonder Gri Fel and Terapishim had wanted to bring him in! There was no telling what he might pull out to help them out! Which, he had to admit, was actually a pretty good argument in their favor. As the manse completed, Charles collected one of the three rating-0 hearthstones and took the other two to Gri Fel and Terapishim. Gri Fel and Terapishim were continuing their labors – showing the subtlety and craftsmanship that one would expect of powerful, experienced, celestial deities. (Charles) “Nothing much really! They just let the manse and those it empowers know that you’re on the board of directors! That should get you some assistants soon! It’s designed to empower city-guardians, and experts, and traders, and so on! It didn’t take them too long to determine that the manse was safe, and useful, and supported the city in a variety of ways – and offered a tantalizing hint of further power. It didn’t take much longer after that for them to decipher the three oaths. The first disaster was a serious earthquake, that might have collapsed several structures, and injured many, if it hadn’t been for the various wards and reinforcements. Gri Fel and Terapishim had the guardians help out with disaster relief in the surrounding communities and with what little was needed in Arcosanti. That attracted a good deal of local media attention though; news of it’s remarkable upswing in fortunes, and of the artistic and technical (and “new-age”…) renaissance going on there, was quite a good story! Fortunately, the guardians were mostly involved with indoors work – packing relief packages and the like. Gri Fel quietly walked the city in mortal guise, using the Rod of Construction to provide secret assistance with repair and reconstruction efforts. Over the next couple of simulated months, Arcosanti not only recovered but experienced something of a boom – it’s enhanced facilities drawing numerous occultists and beginning to make it a center of trade. The manse achieved it’s full quota of guardians and the stacked-up wards over Arcosanti reached the point where any more would start interfering with each other. 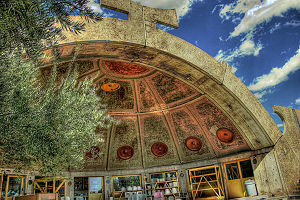 Then – of course – there was another incident… Arcosanti was in a fairly dry region. One day, construction workers hit a spring. Unfortunately, the spirit of that spring was quite irritated at being disturbed… There was soon modest flooding. Terapishim’s blessing kept the topsoil from being eroded by the water, preventing any side effects from that, but it didn’t directly affect buildings; the wards DID of course, but letting that go on too long would start making it obvious that something supernatural was involved. She was showing no signs of stopping. It looked like Gri Fel and Terapishim would have to negotiate with her. Charles trailed along, but intended to mostly stay out of that one… He had no great social skills – although some of the three hundred guardians did. Gri Fel and Terapishim brought along quite a few of the subordinates. After some intense negotiations (and their entourage did impress her), they managed to come to an understanding; she agreed to stop the flooding as long as they built some sort of shrine for her. Charles could help with that! Why the place even had a fair touch of Geomantic power available! He designed an extremely nice little manse – with the “divine apartments” and “access to Yu-Shan style goodies” powers. Terapishim’s powers over the earth helprf the land dry up quickly, and Gri Fel again assisted with what reconstruction was required. After another three months the town was becoming prosperous thanks to the Manse… Artists were gathering there. With them come more conventional people – along with the steady flow of Occultists. Unfortunately, along with that came an increase in the crime rate… Disappearances seemed to be topping the list. That was more Gri Fels field, although Charles deployed some scouts to help keep watch. It didn’t take Gri Fel long to find that everyone involved seemed to have gone to a particular art gallery outside of the Manse. Terapishim didn’t like the looks of the Essence around that place… It seemed awfully chaotic in places. Mild, but still troubling. To Charles… It was a very nice art gallery indeed. It was also new – and the Essence was definitely fey. Charles wandered in to have a look – and really wasn’t surprised to find a male fey feeding. He did have a fairly human body, and had even hidden the ears – but it’s hard for a Fey to hide feeding on one’s Temperance. Charles could see the gossamer-like dreams flowing into his mouth. He tried to feed on Charles – and failed miserably. The woman, knowing that something is up, promptly escaped. Hmm! This was policy! Policy was more or less up to Gri Fel and Terapishim! It was rare that fey dared to live in Creation’s cities these days. In old times, the city gods of Great Forks allowed Raksha as long as they didn’t overfeed. Other cities were often less lenient… but really, anyone could be a Raksha considering some of their Charms. Gri Fel (like the majority of gods) was a hardliner, but then his city was at the center of Creation. Terapishim was a bit more lenient. Drat it! They seemed to be at an impasse right now! Well, it wouldn’t take long to cultivate a small demesne in the hills nearby – there seemed to be a couple of rating-one demesnes out there already – and set up a freehold. The fey made GREAT artists and could – if willing – contribute some very interesting elements to a city. With the manse-guardians available to keep things under control a few Fey hanging about really shouldn’t be much of any trouble. They struck a deal – and the manse made it binding. Their small freehold would function as an artists colony nearby. That would let them contribute, get their motes, and be harmless. Gri Fel took some persuading, but – as long is it was outside the city – was willing to put up with it. There tests closed with a flurry of simultaneous, but minor problems – perhaps with the intent of seeing which ones were dealt with first, perhaps to see how many could be handled at a time. As it happened, with the manse-guardians helping out, and the artifacts, and Charles, there were plenty of people to spare to meet all of them simultaneously. The simulations ended – and the proctors announced that the results would be tabulated, and announced in their turn, in a comparatively short time… about a month.